BiblioPolit: Did 67.8% or 57% of matrics pass in 2010? But, not so quick! Those pupils that failed previously, and have now rewritten their exams, surely they passed this time, should be seen as a boost to the pass-rate! 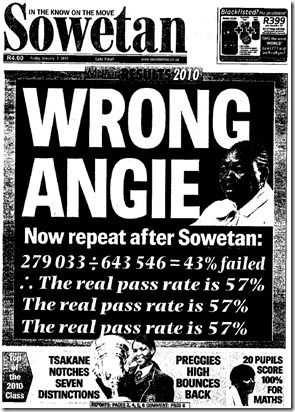 Since these pupils failed in 2009, and they are not included in the pass-rate in 2010 (even though they wrote and hopefully passed this time around), according to the DoE, these people are never part of a passing calculation! The problem with the results of 2010, is that there are just too many questions regarding the results. It really looks like there has been some fudging of the actual data, and the way calculations are done. If the financial officer of a company is caught doing that, he will be fired and criminal charges could be laid against him. Why is it so different with our matric results? Wouldn’t it be better to know the exact state of our educational system? An alcoholic can only be helped if he admits with honesty that there is a problem. While he lies to himself and others about his problem, and its extent, he cannot be helped! It is the same with our DoE. While they do not admit to the extent of South Africa’s educational problems, they cannot be helped! The cure for our educational woes can only progress to the extent that the DoE acknowledges its problems, and owns up to the problems it has created with its terrible policies! My guess is that the DoE, and Umalusi, will continue to hide the true facts behind which subjects were adjusted upward (or downward) and why, and also why those subjects were not adjusted across the board, but rather selectively. Time will only tell where our educational system will go in the future. The hope is that it will improve, but don’t hold your breath! Posted by Unknown at Tuesday, January 11, 2011 Email post to a friend!